I met her at the Speak Up Conference (which I highly recommend you attend by the way). She looked familiar but we couldn’t figure out the connection. We quickly discovered that we were both writing books about control…so maybe our spirits felt familiar to one another because of that. I’m honored to introduce you to the lovely Shannon Popkin who is guest posting today. Author and speaker, Shannon Popkin, loves to blend her gifts for humor and storytelling with her passion for the Truth of God’s Word. Shannon’s first book, Control Girl: Lessons on Surrendering Your Burden of Control From 7 Women of the Bible, is to be released in 2016 by Kregel Publications. 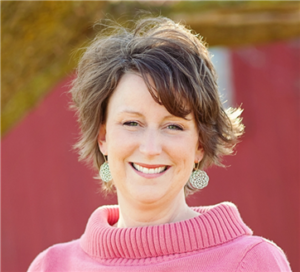 Shannon has been published by a variety of ministries and magazines, such as Thriving Family, Family Fun, and P31, and she is a contributor on the True Woman blog and the Dove Foundation blog. Shannon is happy to be sharing life with Ken, who makes her laugh every single day. Together, they live the fast-paced life of parenting two teens and a tween. For more about Shannon’s speaking and writing ministry, please visit www.shannonpopkin.com or find her on facebook or twitter. I was a really good mom to littles. I was good at keeping little fingers away from electrical outlets, little feet away from roads, and little eyes from material that wasn’t age appropriate. This should have been a clue to me that I was a Control Girl. I see it now; I didn’t see it back then. I just thought I was protective and caring. But in reality I was a good mom of littles because I was good at being in control. And as my children grew, I really didn’t like giving up control. I still don’t. As a self-professing Control Girl, one of my biggest struggles is loosening my grip on all of the things I could control when my kids were little. I’d love to go back to the days when I combed their hair, picked out their clothes, chose what they would eat, and censored every bit of media they were exposed to. But now that my kids are taller than me, this would be insulting for them, exhausting for me, and a miserable way of life for all of us. Really, the only thing that fits into Category 1 is me. I can control my own actions, responses, and attitudes. But everything else belongs in Category 2. 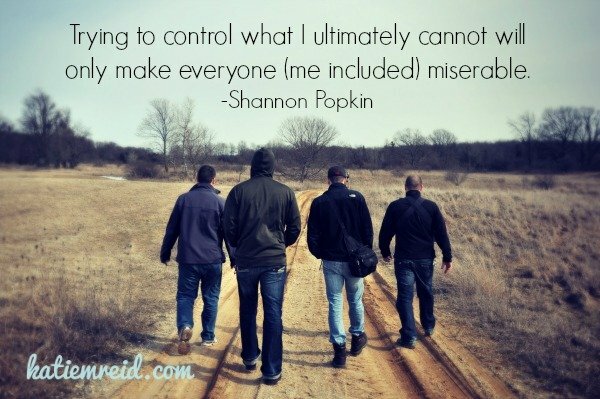 I can’t ultimately control what other people do, or what happens around me. Dr. Sanford suggests that good parents HOLD & FOLD, respectively. For Category 1, we should HOLD responsibility for ourselves—for our actions and reactions. But for Category 2 (everything else), we must learn to FOLD our hands and trust God, rather than trying to control what we ultimately can’t (pp. 60-70). These responses change as our children grow. Here’s a good rule of thumb: When my child is small enough to hold, it is good and right to HOLD responsibility for her, and control her environment. The smaller my child, the more I must control what she eats, wears, or touches. She is my responsibility! But gradually as my child becomes too big to hold or pick up, it’s time to transition to FOLDing. I’ll always have influence, but little by little I must entrust my child back to God. And when my children are fully grown, I must give up control completely. Trying to control what I ultimately cannot will only make everyone (me included) miserable. I laughed. The ages of 7-12 are years of great transition. Yes, your child might still sit on your lap, but no, you shouldn’t scold him if he crosses the street without holding your hand. Picture yourself straddling the line between Category 1 and Category 2, during these transition years. Sometimes you’ll need to HOLD; other times you’ll have to FOLD. You’ll need wisdom from God as you parent your particular child on how much independence to introduce, when. This transition from being completely responsible for my newborn babies, to relinquishing more control each year has been extremely painful and difficult. Giving my daughter keys to her first car seemed like something only a crazy mother would do! And sometimes, letting my son walk out of the house in the clothes he’s chosen seems even crazier! But trying to control like I did when they were small would drive us all crazy. I love that this chapter of I Peter is written to people who “shepherd the flock of God that is among you” (vs. 2), because that is how I see myself. I’m a mom, shepherding my little flock of children, who belong to God. And yes, this role creates a lot of anxiety in me! But rather than rolling His eyes when I start fretting over my child’s grades or friendships or habit of throwing clothes on the floor, God leans down with an invitation. He says, “Why don’t you fling those burdens up on My back?” And why should I do this? Because God cares for me. His intentions toward me are tender and kind, when He reminds me that I was never intended to struggle under my burden of trying to control my child’s entire life. 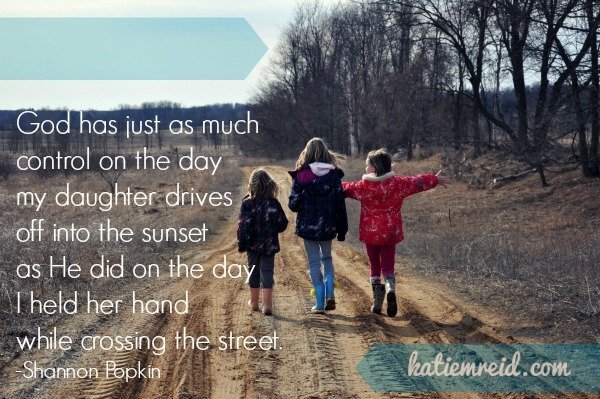 God has just as much control on the day my daughter drives off into the sunset as He did on the day I held her hand while crossing the street. God is watching over my son just as carefully on the day I send him on a missions trip in another country, as on the day I gave him permission to swim in the neighbor’s kiddie pool. God doesn’t always keep my children from skinning their knees or crashing their cars; He allows trials and disappointments that I wouldn’t because He is far better at parenting than I am. He knows that the painful things in life are what cause both children and moms to look up, and recognize He is in control, rather than living like we are. Controlling my kids isn’t God’s long term goal for my parenting. It’s not His goal for me, in general. God designed me to live in sweet surrender to Him. He wants me to trust Him, not trust myself. Sometimes I lose this perspective and start fretting, pacing, clinging, clamping down, and making everyone groan. But that’s when God invites me again to FOLD my hands and surrender the things I can’t control into His care. 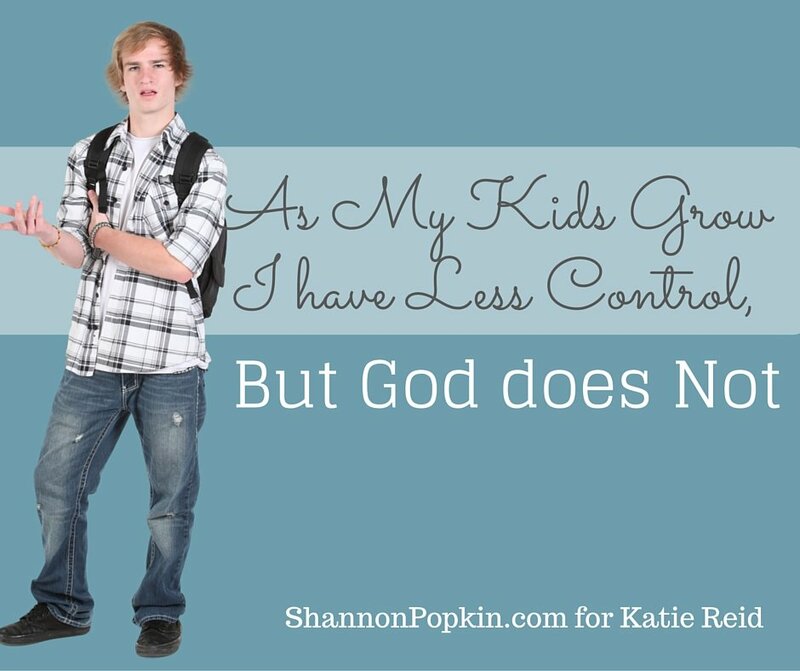 As my children grow, I have less control, but God does not. He is the good, caring Shepherd, who holds everything in his care. P.S. Add your post to the #RaRaLinkup and #TellHisStory too. Love this. Thank-you! I’m a recovering control-a-holic too! Shortly after becoming a mom, God showed me that I was trying to control everything because I was really just afraid, and I didn’t trust Him to take care of it! Yikes! I still need this reminder often. Thank-you. Brooke, I had a similar experience. For me it was anger. I was reading books about anger, asking friends to hold me accountable, praying about my anger… Then God showed me that it was my underlying desire for control causing the anger. When I started connecting the two–anger and control–I began getting traction with my anger. I think it’s the same with fear. When we realize that our fear is driven by a desire for control, we can get traction with our fear issues. I also relate with needing reminders on this! I just this past week noticed I was slipping back into some old patterns of anger and fear (I struggle with both) related to some things I want to control. And I’ve just written a book about the topic! 🙂 I think it will always be a struggle for me, but it’s my weakness that causes me to turn to the Lord, so because of that I am thankful. So nice to “meet” you, here on Katie’s blog. God bless! So true, Brenda! Somehow it feels like if I can see them and hold them on my lap, I’m the one in control. I was just last night watching a mom with six kids at a social event. Her baby was crawling into the sanctuary out of sight and her older kids were out in the parking lot, and she was so relaxed! We laughed that her two year old was wearing a dressy summer dress with tights and boots and lots of necklaces (she insisted). I think my friend has come to realize (in a way that I never did with only 3 kids) that she can’t control everything, but God can. There is such a sweet trust in that! And trust is so different from despondency. Trust has hope that God IS in control, and all is well. Happy to be your neighbor at Jennifer’s link up! I’m a fixer, in other words, I like to help God out in fixing other people. Control is another word for it. I have to continually ask God for help to trust Him and let go!